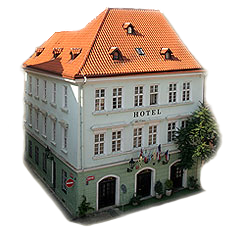 Betlem Club Hotel is located near Charles Bridge in the heart of Old Town Prague on the right bank of the Vltava River. Charles Bridge and Old Town Square are just a 5 minute stroll from the hotel. Nearby are Hradcany, Prague Castle, the Jewish Town - Josefov, the Royal Route, Bethlehem Chapel and many other landmarks of Old Town Prague. The Charles Bridge (Czech. Karlův most) is the oldest and most famous bridge in Prague. Connecting the Old Town with Lesser Town, the Royal Route, where some of the most famous sights in Prague are, crosses the bridge. The Charles Bridge is a wonderful example of Luxembourg architecture. It is built out of sandstone blocks is 515.76 m long, 9.40 to 9.60 m wide and the roadway is 13 m above the normal water level. The bridge is supported by fifteen pillars, connected to sixteen vault arches. The bridge is complemented with three towers. On the Old Town side there is an internal pillar called the Old Town Bridge Tower. On the Lesser Town side the bridge is closed by the larger and smaller Lesser Town Bridge Towers. The Charles Bridge founded by Czech King Charles IV. in 1357. The founding date of the bridge was probably carefully calculated and had its numerical mysticism and astrological significance. The legends say that the first stone was laid by the King himself on July 9, 1357, at 5:31am, since that date corresponds to a favorable alignment of the Sun and Saturn.